Around the world and mainly in Asia, insects are a key part of the diet of up to two billion people. Farming insects is a fraction of the cost of producing beef, pork and poultry. 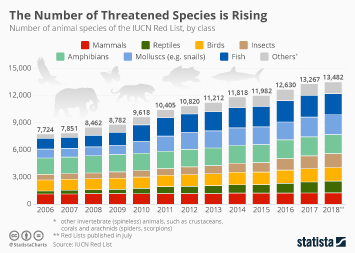 According to United Nations' Food & Agriculture Organization data published by Bloomberg, producing a kilogram of crickets requires less than a fifth of the feed that a cow would eat to produce the same amount of beef. Insects also negate the need for antibiotics, growth hormones and require far less water than conventional livestock. As a result, insect farming has become more common and with nearly 2,000 different species edible, expect them to come to a menu near you in the not too distant future. 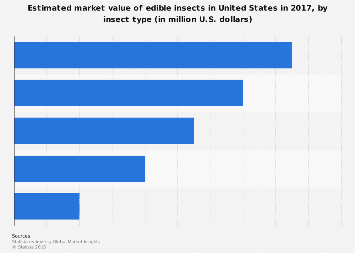 By 2023, the value of the global edible insect market is expected to triple and its value will climb from $44 million to $154 million in the U.S. alone by 2023. As can be seen by the following map, insect farming has huge potential across much of the world. 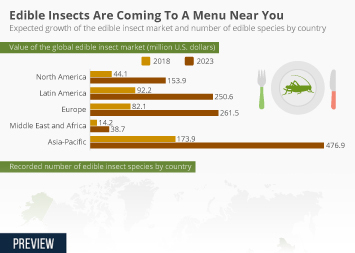 This chart shows the expected growth of the edible insect market and number of edible species by country.